The Sony A5100 is proof that appearances can be deceptive. Although it looks almost identical to the previous A500 model, the new A5100 is a much more capable camera, especially when it comes to focusing and recording video. 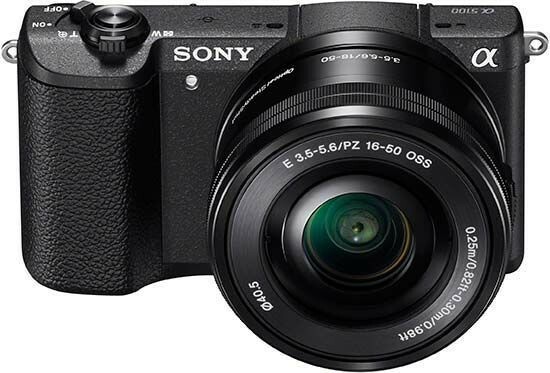 It's also a much more compact alternative to its big brother, the A6000, especially as it offers a lot of the same features and even out-performs that model in a few areas. One of the main reasons for considering the A5100 is the significantly improved Fast Hybrid AF system that's trickled down from the A6000. With 25 contrast-detect and 179 phase-detect points covering 92% of the image, the Sony A5100 is one of the few mirrorless cameras on the market that can successfully track a moving subject and keep it in focus. Coupled with the capable 6fps burst shooting rate with subject-tracking and the fast 0.06 second AF speed, the A5100 is the best mid-range compact system camera for capturing fast moving subjects. The A5100 also uses the same 24.3 megapixel sensor and Bionz X processor as the A6000, which ensures that image quality is excellent, with results easily rivalling even the DSLR competition and beating most of its compact system camera rivals. Noise doesn't rear its ugly head until ISO 3200 for JPEGs and even the faster settings prove eminently usable, although the A5100 does apply some pretty aggressive noise reduction to keep the files clean as shown by the much noisier RAW images. The myriad of creative effects such as HDR, Dynamic Range Optimisation, creative styles, picture effects and the innovative sweep panorama mode also help to get the most out of the A5100. The introduction of a touchscreen interface, although limited to setting the focus point and firing the shutter, definitely broadens the appeal of the A5100 to smartphone users. It makes things like setting the AF point much easier, something that is particularly long-winded on the more expensive A6000, which doesn't have a touch-screen. Support for the XAVC S video format is also something that the A5100 uniquely offers at this price-point (and which the A6000 doesn't offer). Looking and feeling very much like a compact camera, thanks to the combination of the finger-tip zoom lever and the 16-50mm power-zoom kit lens, the small and lightweight Sony A5100 is a great introduction to interchangeable lens cameras. Despite its diminutive size, the new A5100 still manages to retain its predecessor's built-in flash and 180-degree tilting LCD screen, while the built-in wi-fi and NFC connectivity make it straight-forward to share your photos and remotely control the A5100 itself. The scarcity of of external controls, a viewfinder, multi interface shoe for attaching a more powerful flash and a rotating LCD screen may push enthusiasts towards the A6000, but the new Sony A5100 is a simple to use yet powerful interchangeable lens camera that outperforms all of its main rivals.